Gathering on the 50 kilometer-long muddy Teknaf road, Rohingya Muslims almost crushed each other trying to catch the clothing and rice bags being thrown from moving trucks. Bangladesh, for the first time in 15 days, assisted the Rohingya Muslims, who are expecting aid in their bamboo-made makeshift tents. Gathering on the 50 kilometer-long muddy Teknaf road, Rohingya Muslims almost crushed each other trying to catch the clothing and rice bags being thrown from moving trucks. No crisis desk has yet been established in Rakhine, where aid is delivered in an unorganized manner. Yeni Şafak visited a refugee camp that hosts Rohingya Muslims fleeing the systematic genocide committed by Myanmar's army and Buddhists. Rohingya Muslims walk barefoot as they carry what they can salvage of their belongings on their backs. Arriving in the region just as the persecution in Rakhine started, the Humanitarian Relief Foundation (İHH), a Turkish aid agency, helps the refugees survive, by providing 2,000 people with a hot meal every day. İHH teams, welcoming the weary Rohingya Muslims who manage to cross the Naf River at the Rakhine border, distribute water, fruit juice or food packages to the newcomers. Providing nearly 2,000 families with rice and 200 families with financial aid in the Palonkhali camp, the Humanitarian Relief Foundation said that they have reached around 45,000 people so far. Visiting Bangladesh with President Recep Tayyip Erdoğan’s wife Emine Erdoğan, “The moment Bangladesh permits the establishment of camps, we can load the tents on the ship and send them. We are ready to provide aid in many fields such as shelter, health and education, as well as food,” the Turkish Disaster and Emergency Management Presidency (AFAD) President Mehmet Güllüoğlu said. “Stop Rohingya Genocide” was the common slogan during a protest in front of the government offices at 10 Downing Street in the British capital, London on Saturday.Around 200 people staged a protest holding pictures, placards and banners all condemning the latest atrocities against the Muslim minority by Myanmar’s army and government.“This is anger! We are expressing our anger against the Burmese government who is doing genocide against our people,” Nurul Islam, the president of Arakan Rohingya National Organization (ARNO), told Anadolu Agency.“We want to draw attention of the U.K. government, being a member of the [UN] Security Council and a powerful country,” he said.“The U.K. government must intervene now,” he added.Some of the placards read “Stop Genocide on Rohingya in Arakan”, “Stop Restriction of Aid”, and “UK Condemn do not Deny Rohingya Genocide!”Some protesters held graphic photos of the victims killed during the latest atrocities targeting Rohingya civilians.“We don’t want to live a life of humiliation as refugees and as beggars in Bangladesh or elsewhere. We want to live in our own homeland and die in our homeland,” Islam added.“It is important that a safe zone is created inside Arakan. Humanitarian intervention is necessary,” he said.Islam also said they were encouraged very much by the works of the Turkish government and its president. 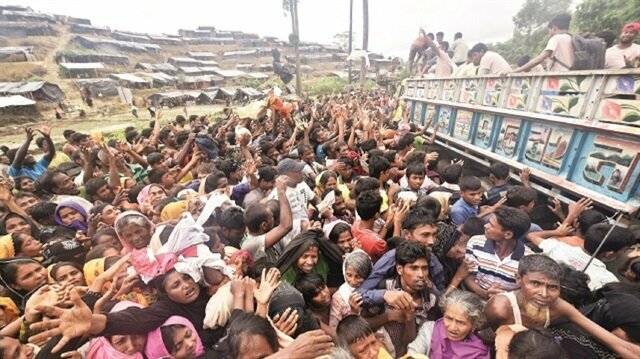 “Turkish government and president was the first to address the rescue of Rohingya people.”-Need for UN interventionThe UK Burma Rohingya Organization President Tun Khin also spoke to Anadolu Agency and underlined the necessity of an urgent UN intervention in the region.“We need urgent UN intervention… We need immediate action from the Downing Street (British government),” Khin said.Khin said: “We really appreciate Turkish government’s continuous support. We would like to thank president Erdogan for raising this issue to the international level. I hope Turkish government will raise this issue with other governments for a collective action.” Another protester, a refugee from Arakan, Mohammed Nouri told Anadolu Agency that he came to the U.K. from Myanmar with his family in 1992.“We, Rohingya people are feeling very proud of them who went there and supported this minority people,” Nouri said, referring to the visit to the region by Turkish first lady Emine Erdogan and Foreign Minister Mevlut Cavusoglu.“We are thankful to the Turkish president who is showing us humanity and sympathy,” he added. Shimul Sultana, a Bangladeshi protester said she was at the protest to, “fight for the Rohingya people because there’s no one else out there to fight for them” and to protest because, “especially this genocide is going on.”“This time they are just ethnic cleansing the people… We are thankful to Turkish government for standing up to Burmese government but we need all the other countries to step up and face it.”A Budhist protester Maung Zarni said he was at the protest, “to tell the truth about the Rohingya people.”“My own country has disowned them and treated them as a subject of genocide for the last 40 years,” Zarni, an academician from Myanmar told Anadolu Agency.“I am here to tell the world that Rohingya are not terrorists… they are our own people… and that the Burmese military adopted anti-Muslim and racist policies against the Rohingya.”“I am here to tell the British government that they have blood on their hands because they are training the killer military, they are supporting Aung San Suu Kyi.”The commission headed by the former UN chief recommended the government in Myanmar ensure full humanitarian aid access across Rakhine, persecute human rights violators, end restrictions of movement and segregation as well as “revisit” the Citizenship Law of 1982.More than 250,000 Rohingya refugees have fled to Bangladesh in the last two weeks to evade persecution in Myanmar, the UN said Friday.New York-based Human Rights Watch (HRW) said it interviewed 50 recently arrived Rohingya refugees in Bangladesh who described killings, shelling and arson in their villages.Turkish President Recep Tayyip Erdogan has promised to raise the plight of the Rohingya at the annual meeting of UN General Assembly later this monthThe Rohingya, described by the UN as the world’s most persecuted people, have faced heightened fears of attack since dozens were killed in communal violence in 2012.Last October, following attacks on border posts in Maungdaw, Myanmar security forces launched a five-month crackdown in which, according to Rohingya groups, around 400 people were killed.The UN has documented mass gang rapes, killings -- including those of infants and young children -- brutal beatings, and disappearances committed by security personnel.UN investigators said the human rights violations indicated crimes against humanity. Stating that Turkey took an important step to draw the world’s attention to Rakhine, “People and institutions from various countries who noted our visit to Bangladesh call us and ask us what they can do [for Rohingya Muslims]. After permission is granted, many countries will help Rohingya Muslims,” Güllüoğlu said. An estimated 300,000 Rohingya refugees have fled Myanmar in the past two weeks and sought refuge in Bangladesh, where two existing refugee camps are "bursting at the seams", according to the U.N. refugee agency UNHCR. In a crackdown last October, the UN documented mass gang rapes, killings – including infants and young children – brutal beatings and disappearances that constituted evidence of human rights violations by security forces that indicated crimes against humanity.